"I have learned so much from the 'Advanced Pruning' textbook that you publish... I cannot express my appreciation in words." 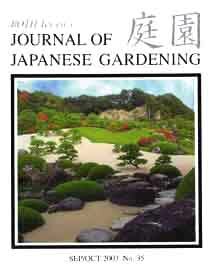 JOJG runs occasional articles about bonsai and Japanese garden topics that are related to bonsai trees. Many of these articles strive to compare and contrast bonsai plants with Japanese garden plants. There is some overlap between the topics, particularly in regard to pruning and bonsai care. Ultimately, however, they are different activities with different goals. Bonsai is a hobby (or art), with the relatively small bonsai tree serving as something like a pet or art object. Japanese gardens are full-size living environments. The differences in scale and function are significant. Any serious plant person would also recognize that growing bonsai trees in bonsai pots is a much different endeavor than growing large trees and shrubs in an expansive garden space. BONSAI LEADERSHIP Bonsai leaders such as Bill Valavanis, Dennis Makishima, Bill Castellon, David DeGroot, Edzard Teubert, and Jim Doyle are also involved in Japanese garden construction and maintenance. TYPES OF BONSAI TREES Bonsai has many standard styles such as upright, windswept, and semi-cascade. Japanese garden specimen trees also exhibit similar patterns. These articles discuss tree shapes and tree styles. HOW TO TAKE CARE OF BONSAI Taking care of bonsai trees is a serious endeavor - perhaps even more serious than the care required by Japanese gardens. These articles examine the care of bonsai and compare those procedures with techniques used to care for Japanese gardens. BONSAI VS. JAPANESE GARDENING These articles compare and contrast the two subjects. There is definitely some overlap, but there are also areas where the two subjects are vastly different. JAPANESE PRUNING TECHNIQUES Nowhere do the activities of bonsai and Japanese gardening overlap more than in the field of aesthetic tree pruning. Many pruning techniques can be applied to both subjects. A few can not.